I am writing this quick post in response to the recent earthquakes and tsunamis that are affecting Japan. As soon as the news broke, and we began to hear of tsunami warning for our area, I immediately realized how under prepared I was for a natural disaster. The thing that drove this point home even deeper was the number of people asking me for advice on what they could do to prepare for the possibility that we are hit by one of the resultant tsunamis. Many thoughts raced through my mind, and I began to assemble a list of equipment I have available and what I would need in order to survive for several days in case utilities such as water, electricity and phone were cut off. I will break the list into several parts which include tools, miscellaneous equipment and food items. The primary focus in any survival situation are water, shelter and food in that order. Being somewhat of a person that is totally into watching survival shows and reading survival books, I hope I can help some people prepare for disasters which we can only hope will never occur. Preparedness is key in these situations. 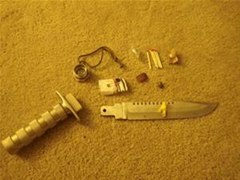 Here, I will list what I think the basic survival tools are. This is by no means a comprehensive or all inclusive list. 1. 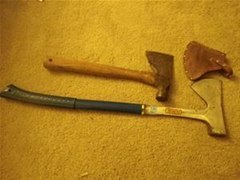 Hatchet or Axe or Machete: Useful for preparing firewood, clearing paths, removing debris, etc. This tool could be your lifeline in certain situations. Choose a high quality product over a cheap price. Notice the metal handle wrapped in a synthetic covering on the axe. Keep the cutting edges sharp. 2. Shovel: Useful for digging fire pits, latrines, finding water, etc. Fiberglass handles are more durable, comfortable, and no risk of splinters. I would recommend a medium sized spade head rather than a square head for this purpose. Some shovels have a fold out pick and serrated edge, this can be even more useful in hard ground, but not absolutely necessary. I have shown a few useful tools to have on hand. 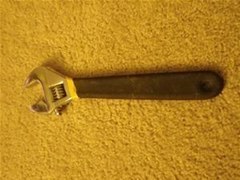 I keep my multi-tool on my belt at all times; it comes in handy in all situations, not just emergencies. A pocket knife is also good to have. Make sure to choose one that is well made and has at a minimum can opener and 2 blades. When choosing a multi-tool, get one with a lot of features, and look for a quality tool, not the cheap knockoffs. 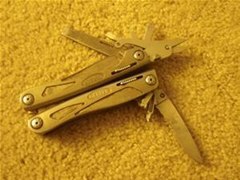 I have had the pocket knife shown in the picture above for 18 years, and the multi-tool above for 14 years. 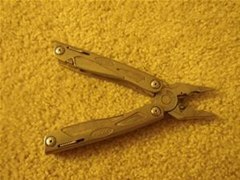 The multi-tool also has needle-nose pliers, which can really help you out of a jam. An adjustable wrench will even come in handy. 5. 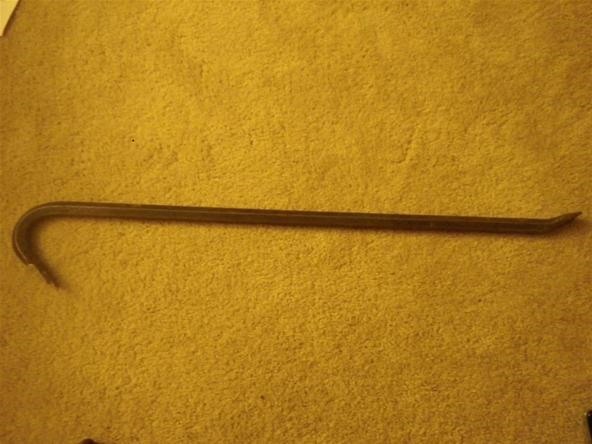 Pry bar: Pry bars are useful for recovery, rescue, removing debris, and protection among other things. A good 3' bar is nice to have; it will allow you to move things easily. A 6' breaker bar is even better and can help clear larger debris, such as concrete, brick, rock, or tree limbs that may be obstructing pathways. 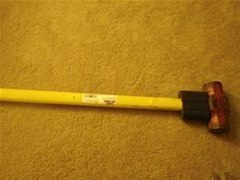 I have a breaker/San Angelo bar from fixing concrete around the house. 6. Sturdy knife: A good survival knife is key in a survival situation. A full tang knife, in which the blade's steel runs the whole length of the handle, is preferable. Choose a grip material that is made from synthetic or composite materials. Wood handles look nice, but with repeated use and wear may lead to splinters, which are undesirable and painful. A combination knife/saw or knife with regular and serrated blade are desirable, but not absolutely required. Notice how the blade steel extends through the knife handle. There is also a hammer pommel and claw. I keep a fire flint and blade sharpener in the carrying case. 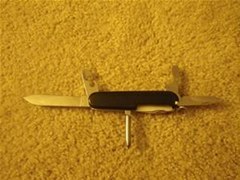 Try to avoid "survival knives" that they sell at hardware store as your only knife. The contents of their handles are nice, even helpful, but because of the hollow handle, the blade may be prone to breaking off or falling out in actual use. I have 2, and the blades only have about a 3/8" inset which may or may not hold up to repeated use. 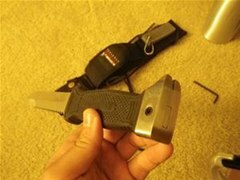 This is a cheap survival knife that I picked up for $10. Notice the contents, matches, compass, fishing hooks, sewing kit, sinker. But look at how slight the blade embedment is. It is far better to keep one of these as a back up, but not for day to day use. 7. Heavy duty work gloves: Having a couple of pairs of work gloves is a essential so you don't injure yourself moving items, building shelter or repairing things. I would strongly recommend one pair of work gloves that are made of leather with double- or triple-ply material at the palms and articulated fingers. The second pair of gloves should be more snug fitting with enhanced grip, such as the rubber coated woven gloves which are stretchy and improve grip for repairing items. This also helps to main dexterity in cramped spaces where you need to be able to feel what you are working on. The leather gloves can also double as oven mitts when cooking and handling hot cooking utensils. 1. Camp stove: Keep a camp stove that can utilize a readily available fuel source for cooking. Coleman makes a combination kerosene/white gas/unleaded fuel stove. Propane is another good option for boiling large quantities of water. Fuels such as Sterno, wax logs, etc. are good for keeping foods warm, but not so great for cooking actual foods. The stove will play an important role in preparing hot foods, boiling water to make it safe for drinking, and being able to thoroughly cook food to stave off food borne illnesses. 2. Water filter: Water is one of the key elements for life. Municipal water services may be lost for an indefinite amount of time in a disaster. A good filter that removes both particulate and microbial matter is of utmost importance. Being able to obtain water is only half of the battle, making it safe to drink is the more important half. Any illnesses related to bad or insufficient water can seriously decrease chances of survival. 2a. Iodine tablets: If you need small amounts of water, iodine tablets can make clear water drinkable in about 30 minutes. 3. Drinking water: Keep a large supply of drinking water on hand to hold you over for the first several days until you can find an alternative source and use your filter or iodine tablets. I believe they recommend 2.5 gallons/per person/per day. Keeping hydrated can help prevent fatigue, boost immunity, and maintain general health. Make sure to drink plenty of water, especially if you are exerting a lot of energy seeking or building shelter and preparing for riding out the storm. 4. Vitamins: Vitamins and minerals are essential to maintaining proper bodily functions. A couple bottles of a standard multivitamin should be sufficient to help fill in any nutritional deficiencies while on a survivalists diet. 5. Cooking implements: Large pots and pans, preferably nonstick for cooking and boiling water. Non stick makes for easier clean up and reduced need for oils and cooking spray. Spatula, large spoon, kitchen knives. Good food can go a long way in keeping morale up and motivating you to rough it through. 5a. Plates, cups and utensils: This is self explanatory, but may be overlooked. Having food with nothing to eat on or with can make survival a difficult task. By using utensils, you also reduce the risk of cross contamination of food and ingesting microbes that may be on your hands. Opt for non-breakable, durable supplies such as tin, aluminum, steel, etc. Try to avoid disposable and plastic items for the simple fact you do not know how long you will need to use them for. 6. Canned foods: Canned foods can literally be a life saver for the first few days while you get oriented to your new reality. They can provide quick and simple nutrition while buying time to prepare for long term survival. Additionally, the cleaned out empty cans and jars can make great storage containers for leftovers, incidental items, storing or boiling water, or as additional cups amongst other applications. 7. Candles, matches, lighters, flashlights, batteries, magnesium block with flint and striker: These items can be useful for providing both light and heat in the night time hours. Even in summer, fire helps to keep predatory animals, and the smoke deters bugs and insects such as mosquitoes and ticks. It's no fun fumbling around in the dark trying to find something or make repairs. 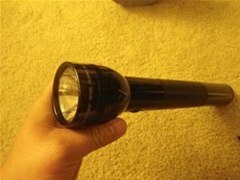 Flashlights are safe and effective for use indoors, very little risk of fire burning down structures and they are easy to turn on and off. A magnesium block is useful as a fire starter because matches can get wet, lighters can run out of lighter fluid, but the solid metal block can be shaved and ignited with the attached flint and striker. 8. Rope and tarp: 100 ft of 3/8" poly or nylon rope is useful for tying things down, togther or making a makeshift shelter in conjunction with a large tarp. Thinner string, fishing line, etc are also useful for tying things together, hanging smaller items and fishing. I would recommend a 10'x20' tarp which can be used to cover holes in the roof of your home, or create a makeshift shelter with the rope suspended between two fixed points like trees. Make sure that you position the tarp to block any oncoming wind or other elements such as rain, sunlight, etc. 9. Tent: A tent is optional, but can be helpful to protect against the elements in case there is any structural damage to your home, or you are forced to evacuate to a different area. The minor comforts this can afford you can also buy you more time to focus on other things since shelter is taken care of. Make sure you know how to assemble the tent before you need to use it. Practice in your living room or back yard. 10. Insect repellent and sunscreen: This is self explanatory, but when working outdoors sunburns can be painful and reduce productivity, perhaps even jeopardizing chances of survival. Keeping yourself healthy is always the first priority. 11. Extra medications, standard first aid kit: Aspirin, anti-diarrhea pills (pepto bismol, imodium, etc. to help prevent excessive water loss), pain relievers, and other first aid and specialty items that family members may require. 12. Battery powered radio: This is an essential piece of equipment in order to be able to obtain information. Try to find a very low power consumption radio, or even one with a solar panel and rechargeable batteries. This will be your life line to information since internet, cell, and phone services will most likely be down. Food is an important part of day to day survival. It is best to keep items that are lightweight and can be stored for long periods of time. Beans, rice, freeze dried foods and pasta make good choices. They require little water in preparation, and the foods absorb the water used for cooking. Salt, pepper and spices help to add flavor to the bland foods and keep morale up. Include fun snacks such as candy, dried fruits, and other favorite items. Remember, excessive sugars and fats will make you thirstier throughout the day, so consume junk food items sparingly. Sugar free chewing gum is good to help keep your mouth from drying out and keep the teeth clean throughout the day. Canned foods are a good choice for a quick meal during the first few days, but they can be cumbersome to move and relocate if the current environment becomes inhospitable. Clean and keep the empty cans for use as additional cups or vessels for holding and boiling water. There are a large variety of freeze dried food kits available on the market now, and I would suggest choosing several of them that suit your tastes. Maintaining personal hygiene in trying times may be difficult, but ultimately it can be a deciding factor in overall health and ability to survive. A few things to have on hand include a tooth brush, floss, toothpicks, toothpaste, mouthwash, hydrogen peroxide, isopropyl alcohol, waterless shampoo and conditioner, waterless hand cleaner, alcohol wipes, hand sanitizer, toilet paper, paper towels and perhaps other personal care items such as lotions, creams, salves, etc. As I stated in the very beginning, this is not a comprehensive list. Please feel free to make any additions or modifications to the above as you feel fit. I am leaving this article open for comments, additions, revisions. Safety is a very serious matter and I feel that everyone should have access to adequate information to help make it through a disaster. 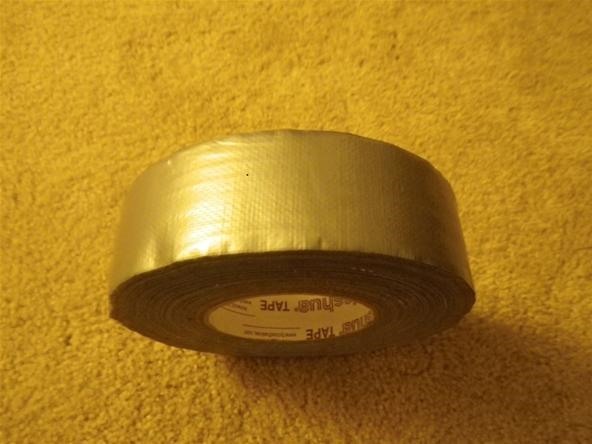 As a final note, as a true MacGyver fan, never, ever forget the duct tape. It can be invaluable for repairing many things from rips in tent fabric, fastening things together, mending shoes, creating waterproof bandages. Way I click on this thinking it was a joke, but very informal. It is nice.. But I think it would be too heavy a kit..
Junix, what would you take out? Here's what I would take out. A machete, a knife, a magnifying glass, a bottle for water.. thats enough I could forage for food as I go.. I would only bring heavy equipments like spade, axe, hammer, crowbar, if I have a vehicle. I really like this article. very nice.